Matthew Hughes. A Little Learning. Hughes posits a novel method for transiting multiverses – the use of chanting. Bandar is a novice of the Institute of Historical Inquiry, wending his way, unseen, through historical incidents, in an attempt to win a bursary at the Institute. However, his best-laid plains are thrown into dangerous confusion as a rival for the award pulls a fast one and leaves him stranded. However, not only can Bandar chant his way out of trouble, he can also affect changes in the size of his bodily parts, a demonstration of which (ahem) with a well-greased matron (I kid you not) is a memorable scene, providing a climax (or several) before the story comes to a slightly flaccid end. A mathematician obsessed with Dedekind domains, finds that his pursuit of zero place theorem brings love to him from the future in the form of a goddess seeking out her own creator (himself) in a complex closed-loop love affair. He is left with memories, and a perpetually warm mug from which she drank. Cover story. An odd-couple on a planet circling Lalande stumble across colossal, ancient statues built by the indigenous race. However, these faces have a strange effect on humans, and the couple are only saved by the hypnotic trance by their unrequited love. Lying abed at night, Dana Graver is in deep despond due to a broken heart, but initially is of course less than overjoyed at the visitation from a zombie. However, after a lengthy conversation, she comes round to seeing the benefits of that which he offers. Arthur Porges. By the Light of Day. A short short by a Big Name, in which a medieval torturer-in-chief has to keep on his toes. Charles Coleman Finlay. After the Gaud Chrysalis. The second adventure involving Vertir and Kuikin (the first in F&SF March 2003). Of that story I wrote : ‘A wry cod-fantasy yarn, in which a wise-cracking pair of thieves go a-robbing. Quite probably a treat if you like that kind of thing’. In this case replace ‘a-robbing’ with ‘a-retrieving’. 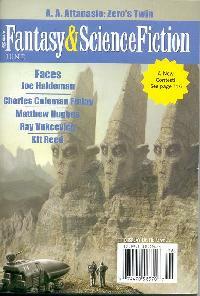 A reasonable issue, covering the spread of F&SF (&H) quite impressively.